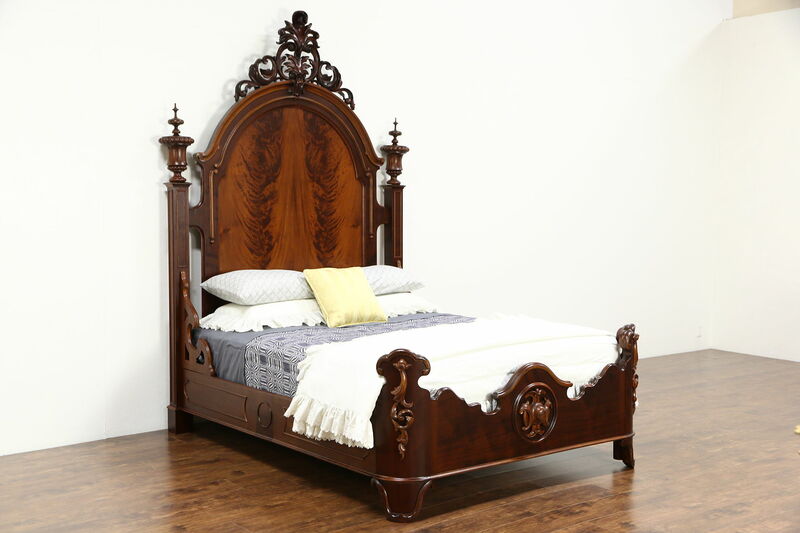 A spectacular Victorian period bed from about 1860 was hand carved of solid walnut with flame grain mahogany panels. The matched flame grain panels are beautiful on this American made antique furniture. The restored satiny finish is in excellent condition and there have been numerous restorations over the last century and a half, see close up photos. There is charming color variation as shown. Three dimensional filigree carving and mammoth finials are extraordinary. Expertly adapted to modern queen size, photos show a demonstrator mattress and spring unit that are 18" thick together. Wood support slats as shown are included. Measurements are 69" wide, 88" long, the headboard is 8' 7" tall and the footboard is 31" high.